Hoor-Paar-Kraat is one of the musical projects of surrealist painter Anthony Mangicapra. He’s been releasing music for over 15 years on various labels. However, my first encounter with this musician was through this latest release, The Place of the Crossing, on Chthonic Streams. The sounds of Hoor-Paar-Kraat fall somewhere between the realms of experimental, ambient, dark ambient, noise and neo-classical among probably several other potential tags. Needless to say, with this wide range of genre associations the music is quite interesting throughout the 22-minutes of this cassette release. There are only two tracks on this album, which are unnamed. The only cue of a separation between the two tracks is the segregation between two sides of the cassette. The music on Part 1 is a gradually progressing aural experience. The sounds incorporated seem to be almost too numerous to fully document. The track starts off in a complete silence that slowly introduces some field recordings of various sounds which amount to maybe something shuffling around on a table. From there is presumably an acoustic guitar which is heavily treated with delay, subtle drones fade in and out of the mix, and a plethora of other natural and/or synthetic instruments come and go. There seem to be tape-loops making up at least some portion of the foundation of this track, though the experimental nature of the track makes it hard to fully settle on any one concrete conclusion. There is a bit of a lull in the middle of the track, before it gradually picks up intensity in the second half; harsher drones becoming the dominant element. Part 2 starts off abruptly with the sounds of classical music being heavily manipulated, likely by means of manually spinning a record, forward, backward, slowly and then much faster and back again. These manipulated classical sounds continue on for several minutes, at times feeling like something that could be comparable to the vinyl manipulations of The Caretaker. By the time we reach the middle of the track, these classical manipulations have faded and been replaced by something much more electronically/digitally oriented. Strange noises, likely originating from some sort of synthesizer effects provide a base for the soundscapes with vocals being played in reverse just beneath the surface of the mix. Like the previous track, as we move toward the end the sounds become harsher before slowly fading back into silence. While it is necessary to use words like harsh and noise to describe some of this music, these elements never move into a territory which would become overwhelming. The beauty of The Place of the Crossing is its ability to be at once heavily experimental and occasionally noisy without ever taking it too far. Restraint is used perfectly to keep the sounds right on this threshold without ever going too far into the harsh noise or chaotically experimental territories. Though these elements create the entirety of the album, it still feels like an often relaxing and always interesting musical experience. 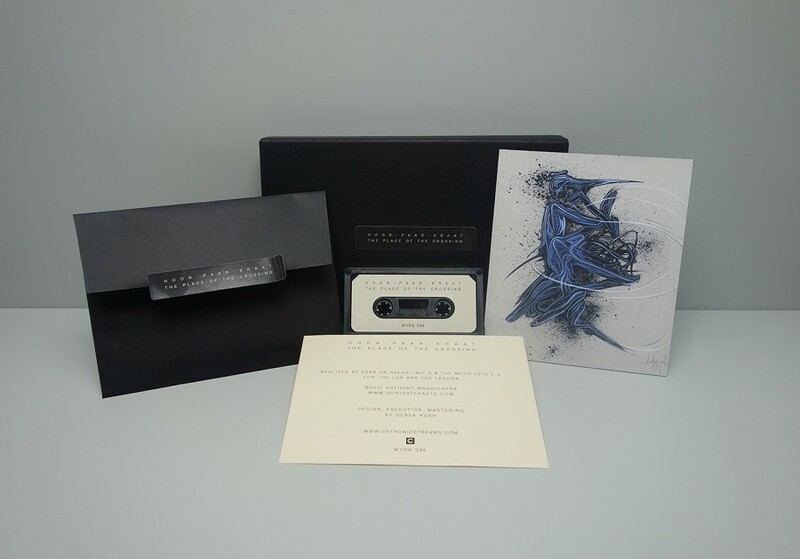 The physical release of this album is presented beautifully by Chthonic Streams in the form of a simplistic yet elegant looking cassette accompanied by an autographed art print and single sheet of high quality paper which presents the albums credits. These are all delivered in a black portfolio box. The cassette seems to be the perfect format for an at times noisy and experimental release of this sort. The manipulations of the soundscapes presented by Hoor-Paar-Kraat will quite likely leave the listener a bit concerned on the first play-through as there are sections where the music literally sounds like the tape is being eaten by the tape player. I find this to be a clever and entertaining element of the product. Its as if the musician is breaking through that fourth wall, giving them the ability to further mess with the mind of the listener.